New Delhi, April 5 (CRICKETNMORE): The Sunrisers Hyderabad (SRH) put on a quality display as they beat the Delhi Capitals (DC) by five wickets at the Feroze Shah Kotla here on a wicket that was pretty low and slow. 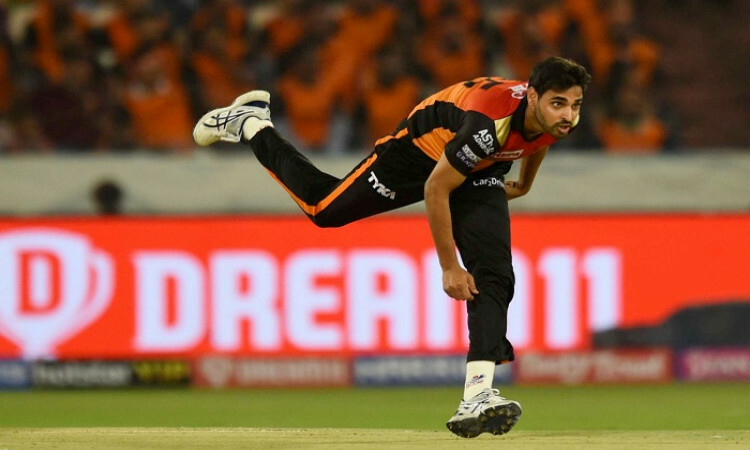 While the decision to win the toss and bowl first from SRH skipper Bhuvneshwar Kumar surprised quite a few, the captain said it was because they weren't sure how the wicket would play. "It is always easy as the captain when the team does well and I always believe that the captain is as good as the team. We weren't sure at the toss about how the pitch would play, but we always wanted to bowl given how small the ground is. We knew that it would be easier in the second innings and it would be a tricky chase; but the start we got was great," he said after the game on Thursday. Asked about regular skipper Kane Williamson's fitness, he said: "Kane is almost there, but we want him to take as much time as he wants." "I needed a little support over there because one of the top four batsmen had to be there, I had taken the responsibility but unfortunately I took on Rashid and got out as well. We had almost lost the game after the first few overs, but the way we came back should be appreciated. The bowlers are mentally strong at the moment. That is really good to see from a captain's point of view," he added.